Which positions would you target? Discussion in 'Transfer Rumours' started by say yes, Apr 13, 2019. CB, wing, Lb. All first team. Young/cheap - cm and rb. 5 signings like last summer. Depending on development bring back Reiss and Emi. IF we get rid of özil, add offensive CM. I want a Good winger. A Good LB and a rb backup/challenger for bellerin and a CB. If we are going to be "minimalistic", I would be happy with a right winger, a left wingback, and a centre back. Nicolas Pepe, Fraser and Umtiti would be my choice. If we sell any players, like Mustafi, Iwobi, Mkhi, Özil etc, we should be looking for replacements for them too. Preferably cheap young talents like Guendouzi and Martinelli. NieThePiet, say yes, bingobob and 1 other person like this. Defense needs to be the first priority, so I went with CB, LB and CM (although I'm not really picky between CM and winger). First off: Mustafi out, better CB in. Ideally, it would be someone who can do for Arsenal what Van Dijk has done for Liverpool. But at the very least, they need a solid, dependable upgrade. I don't think you can depend on Koscielny to stay healthy and play enough games. We don't know yet where Mavropanos is in his development, so I don't think we can assume a particular level of quality there. Nor do I think Chambers is an answer. He's been a bright spot in a poor Fulham team, but playing as a defensive midfielder (I'd be even more concerned if he were playing CB, considering how many goals they've given up). So that leaves Sokratis and Holding, who will be coming back from a serious injury. That's simply not enough. Assuming (admittedly dangerous) Emery plans to go forward with his usual 4-2-3-1/4-3-3 rather than a 3-man back, a left back needs to be a priority as well. Kolasinac isn't really a left back. He's a left wingback who Wenger brought to the club after switching to the 3-4. I love the guy going forward. He's like a freight train. But he's not a defender. Nacho still plays at a high level, but he'll turn 34 during the season and will be entering the last year of his contract (only because Arsenal picked up his option). There's always a chance he could return to Spain this summer as well. He's spoken of wanting to finish his career at Real Sociedad. So there's no security in this position for Arsenal. Certainly Arsenal could use a proven central midfielder and a winger. I chose the CM, mainly because I think Reiss Nelson and even Bukayo Saka could be used to give Arsenal pace and width. On the other hand, I think Emile Smith Rowe looks like a potential Ramsey replacement as well. While I'd prefer to buy more experienced players, I'd be more comfortable giving these players an opportunity than to play unproven talent at the back. Arsenal can scored goals. But if they are to challenge for titles, they need to improve the defense (as Liverpool did). I'd be very happy with just Wan-Bissaka and Nick Pope. Anyone else like a Fraser and Maddison would just be a added bonus. Aaron Wan-Bissaka is a promising young player, but it would be foolish for Arsenal to spend £40 million or more for a backup to Bellerin -- especially with Maitland-Niles doing so well in the position. I could see making a free signing to replace Lichtsteiner for squad depth, but a right back is just about the last thing Arsenal needs. So unless they thought they could convert him to left back -- a major position of need -- it seems a pointless signing. It's just not happening. Backup for Bellerin? Bellerin has never produced a season of overall performances that Wan Bissaka is currently doing this season. Ideally we have two quality RBs in Wan Bissaka and AMN. Bellerin is the weakest performing player in our starting 11 so it's a priority we improve it and move him on but thankfully in AMN recent form suggests we have an improvement internally already. Why would we need a LB? We have two of the top 5 league in Kola and Nacho. 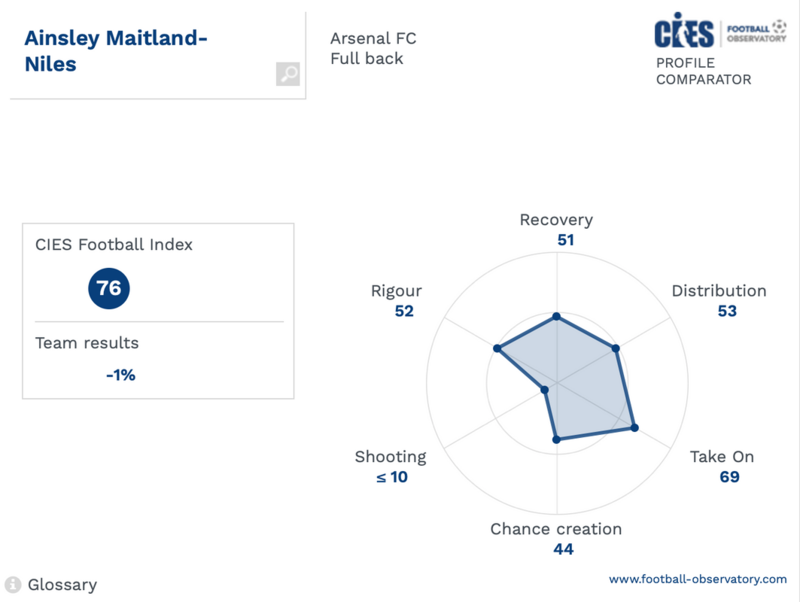 Maitland-Niles actually grades out better. Wan-Bissaka is coveted for his future potential, not for being a complete player at the tender age of 21. As for left back, Kolasinac isn't actually a very good one. He's a fine wingback in a 3-4 system, but if Emery plans on primarily utilizing his favored 4-2-3-1/4-3-3 system in the future, he needs to find a better defender. Nacho will turn 34 during the 2019-20 season and will be in the final year of his contract. So he may not even be at Arsenal when the next season starts. Whether he is or not, Arsenal needs to be addressing the future of that position. Wan Bisska is extremely solid defensively and reminds me of Sagna (obviously Bellerin lack of defensive awareness ia major hindrance to us). Kolasinac has been fantastic at LB or LWB this season for us. Kola has easily been one of top players in line for player of the season. For me it between hin and Robeetson for best player in that position. ThlRama and Sapient Hawk like this. I still think in defence we have enough to get through. Leno is slowly becoming a rock, if not already, Holding is still to come back and between him Koscielny and Sokratis we have a decent centre back pairing. Monreal and Kolasnic can continue to fill in at left back and then we have AMN and a returning Chambers to fill in at Rb until Bellerin returns. Wide midfielders however is square pegs and round holes. If we can sort out the attack then the defence can take care of itself. Weve already improved massively on set pieces. And a more solid attack capable of scoring will hopefully start turning draws into wins and loses into draws. Something in the middle third of the season we done quite well. Wan-Bissaka is extremely solid defensively. That's what I said, actually. But he offers little on the offensive end. Bellerin was playing very solid defensively this season before he was injured and his offensive contributions are invaluable. I find it strange that you are so eager for a defense-first fullback on the right, but want an offense-first fullback on the left. I'd prefer a balanced player on either side of the pitch. Kolasinac has been fantastic offensively, but his obvious defensive shortcomings are less apparent in the 3-4. If Emery wants to continue with the 3-man back, then Kolasinac is a fine choice in that formation. But in a 4-man back, he would probably be better suited to play on the wing where his offensive contributions can be maximized without the problems created by his lack of positional awareness and blips in concentration. In fact, if you check the records, you'll find that he's been a more productive offensive player in the 3-4. He has six assists this season and only one came as a left back. The other five came either as a wingback or playing as a left midfielder. This brings me to Sead Kolasinac, an unusually difficult player to decipher. On the one hand, he is so wonderfully strong and powerful, with legs the size of a horse’s and great speed and vigour as he surges up the left flank. And on the other, a surprising finesse whenever the ball is stuck to his left foot, an accurate delivery, creativity in his passing. Kolasinac is more than the brute that he is often portrayed to be. And then underpinning all this is his defensive work: a strong tackler who is aggressive — sometimes overly so — and eager to win back possession, but lacks the decision-making and sense of danger to ever be a consistently reliable defender. He is an amalgamation of athleticism, delicate elegance, raw, untamed power, and defensive irregularities. That makes him very difficult to figure out. Kolasinac is a fantastic offensive player. He's like a freight train rolling down the pitch. But to mention him in the same breath as Andy Robertson as an all-around left back? Well, no. Just no. cannel and Rex Banner like this. 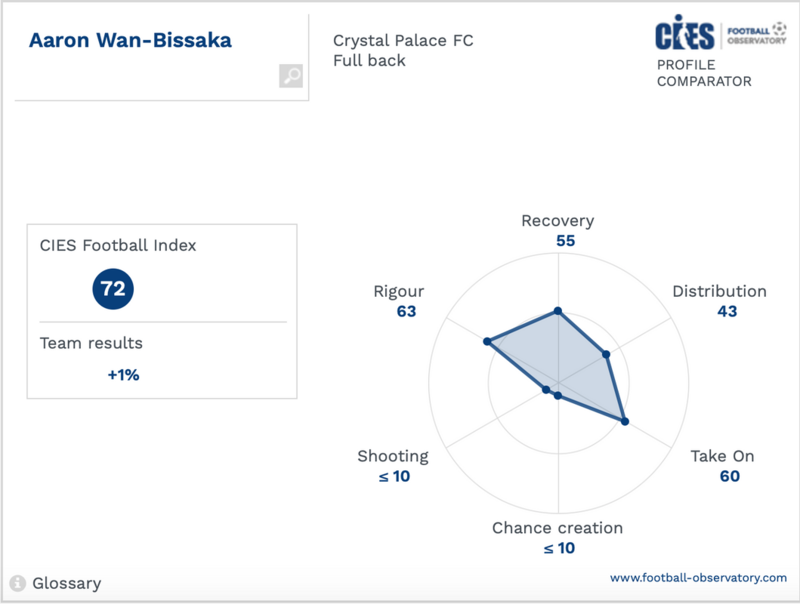 Agree with @Slartibartfast on Wan-Bissaka, I think he really is one of the best RB’s around but 50M for the lad when he offers almost nothing going forward when we have Bellerin is crazy. For me I’d be looking at one of the Norwich full backs Lewis or Aarons if we really wanted to strengthen the position. Both for me are going to go places. Getting another full back would let us move AMN into midfield which I think is his best position. Also I think we should seriously look at Sessegnon. His value’s at probably it’s lowest, CIES has him at 30-40M and rather than spend the money on say Sarr who according to them doesn’t move the needle on much from what we have already in Iwobi I’d say the home grown 18 year old is the smarter buy. Then in terms of CB I’d look to spend the big money, a big ticket buy if at all possible like a Koulibaly would take us to that next level. Also bring back Emi, he should be our back up GK. asukru, Aevius and Slartibartfast like this. I actually think Kola defensively very underrated and he is solid defensively. I mean his positional awareness and dsicipline is actually very good in comparion to most offensive FBs e.g much better than Bellerin. Winger(s) would be my top priority. My eyes are bleeding watching Iwobi and Mkhi playing there. One who could replace Ramsey's goals would be ideal. I miss the days of having a Pires or Ljungberg who could chip in with a decent goal tally. Also in need of a left back as Monreal can't go on forever and has been declining the last 2 seasons. I'd also like a CB as well. I know we have Holding to come back and Papa has been a good signing but Kos can't go on forever and if we are going to be playing 3 at the back I'd like it to be with 3 proper CB's (with none of them being Mustafi). So a CB for rotational purposes/injuries and to maybe eventually replace Kos. Well, we'll just have to agree to disagree on this one. I think you're allowing your affinity for his offensive performances blind you to his defensive deficiencies, but you're entitled to your opinion. But for the record, London-based journalist Sam Tighe, who does the weekly EPL 100 player rankings, dropped Kolasinac to 8th among left backs/left wingbacks in his latest weekly rankings (based largely on his awful performance against Everton). Sead had steadily been ranked 6th behind Robertson, Shaw, Digne, Chilwell and Jonny through most of the season. I would certainly prefer any of those strictly as a left back. Kola is like Ramsey in central midfield under Wenger. Always hanging around the box and leaving the players behind him exposed. 2LBs- Monreal is a liability nowadays and I expect Kola to be back up next season if we bring new LB good for 4 at back, so best to cash in now. MF- offensive minded midfielder to play what Emery wanted from Ramsey. Maybe the most important buy this summer. I want us to deploy 3 midfielders next year. If we sell Xhaka we need to buy two. CB- would be great to get a new CB but I think it will depend if we can sell Mustafi and that is really not easy. WI- we should aim to bring one at least or two depending of sales. Think we really need to sell Mikhi because of options in his contract kicking in a year. Özil will be almost impossible to sell anyway and he is at least an asset for home matches. Iwobi I d keep for one more year unless we get a good offer. CF- not a priority but we still need to be prepared if we get some great offer for Laca. Thats' sounds a more fitting description of Bellerin than Kola.